Rayshon Funches converted the go-ahead basket with 32 seconds left in the fourth quarter, and teammate Emmanuel Austin added a free throw on the ensuing possession to help Legacy secure a 57-54 victory over Democracy Prep in the tournament championship on Saturday night. Legacy senior Rayshon Funches saw a gap in Democracy Prep’s 2-3 zone defense on Saturday night. So he drove to the basket, lofted a floater and won eighth annual Legacy Tip-Off Classic for the host Longhorns. Funches converted the go-ahead basket with 32 seconds left in the fourth quarter, and teammate Emmanuel Austin added a free throw on the ensuing possession to help Legacy secure a 57-54 victory over Democracy Prep in the tournament championship on Saturday night. The 5-foot-11-inch Funches also was named tournament MVP, and enjoyed a vigorous celebration with his teammates near center court while Legacy coach Jack Tarango smiled with satisfaction. 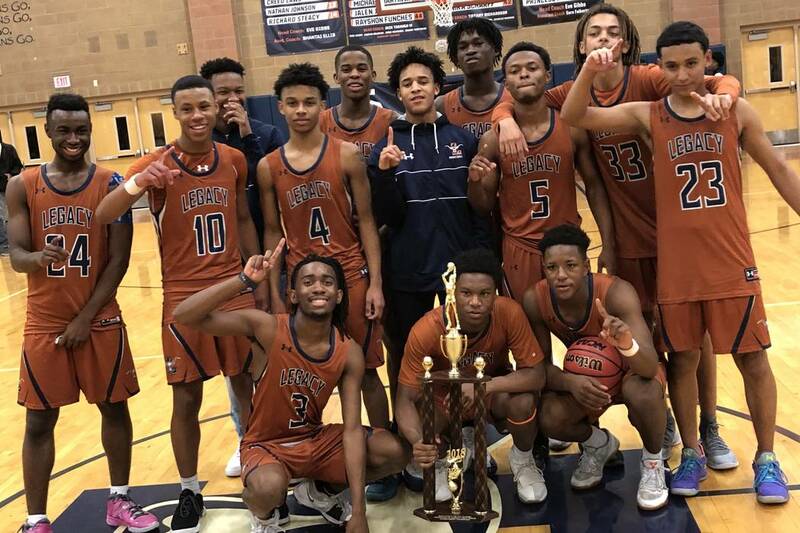 The Longhorns (5-1) were blown out by Arbor View in their season opener Tuesday, but won four straight tournament games to clinch a berth in the championship opposite the Blue Knights, who, as a Class 3A program, beat a pair of Class 4A foes. The teams played to a 26-all tie in the first half, and Democracy Prep opened the second half on a 14-3 run, prompting a timeout from Tarango. Tarango turned to his full-court, man-to-man defense, and ran a second defender at Blue Knights ball handlers before they crossed half court. A few turnovers — and easy baskets — turned the tide for the Longhorns, and a spirited second-half rally set the stage for Funches’ floater. Andrew Garcia led Legacy with 21 points, and Funches scored 16. Daniel Plumer had 22 points to lead the Blue Knights (2-2), and Najeeb Muhammad added 15 points. Legacy 82, Centennial 79 — Shamir Chambers had 22 points, and Garcia scored 22 to help the Longhorns stave off the Bulldogs in semifinal play. Funches added 20 points for Legacy, which outscored Centennial 23-20 in the fourth quarter. Chris Dockery and Jarius Dickson each scored 19 to lead the Bulldogs. Democracy Prep 63, Arbor View 58 — Muhammad made five 3-pointers and scored a season-high 33 points to help the Blue Knights knock off the Aggies in the other semifinal. Kelley Jones added 12 points for Democracy Prep. Larry Holmes, Donovan Yap and Tyre Williams scored 14 points apiece to lead Arbor View. Centennial 73, Arbor View 72 — Jarius Dickson scored 30 points to help the Bulldogs eke by the Aggies in the third-place game. Savio Rivera scored 13 points for Centennial, which was outscored 25-16 in the fourth quarter. Holmes led Arbor View with 25 points. Clovis East (Calif.) 70, Palo Verde 45 — Kade Madsen had 12 points for the Panthers in their fifth-place game loss to the Timberwolves. Enrique Quinones scored a game-high 21 points for Clovis East. Serra (Calif.) 73, Eldorado 61 — The Sundevils fell despite 30 points from Jonathan Thomas. Jason Sykes added 13 points for Eldorado in the losing effort. Jeremy Dent-Smith led Serra with 24 points. Palo Verde 53, Cheyenne 48 — Connor Peterson and Kade Madsen scored 12 points apiece to lead the Panthers past the Desert Shields in consolation play. Glenn Taylor scored 10 points to lead Cheyenne. Clovis East (Calif.) 101, Cimarron-Memorial 78 — Brian Lang scored 20 points for the Spartans in their loss to the Timberwolves. Makhi Walker added 15 points for Cimarron, which allowed 57 points in the first half. Jermal Pittman had 24 points to lead Clovis East. Cimarron-Memorial 43, Cheyenne 38 — Lang scored 15 points to help the Spartans beat the Desert Shields in consolation play. Glenn Taylor, De’Kquante Hayes and J.D. McCormick had 11 points each to lead Cheyenne. Rancho 40, Sunrise Mountain 37 — Quion Cangas scored 13 points, and Christian Folkes added eight points to help the Rams put away the Miners in consolation play. Moises Garcia had 10 points to lead Sunrise Mountain. Aquinas (Calif.) 49, Rancho 47 — James Brown scored 26 points but it wasn’t enough for the Rams to beat the Falcons in consolation play. Nick Hopkins led Aquinas with 17 points.